A Year of Being Here: Mary Chivers: "Late August"
"Late August" by Mary Chivers, from Lasting Words: A Guide to Finding Meaning Toward the Close of Life, by Claire B. Willis. © Green Writers Press, 2014. Thanks to subscriber Claire Willis for suggesting this poem. 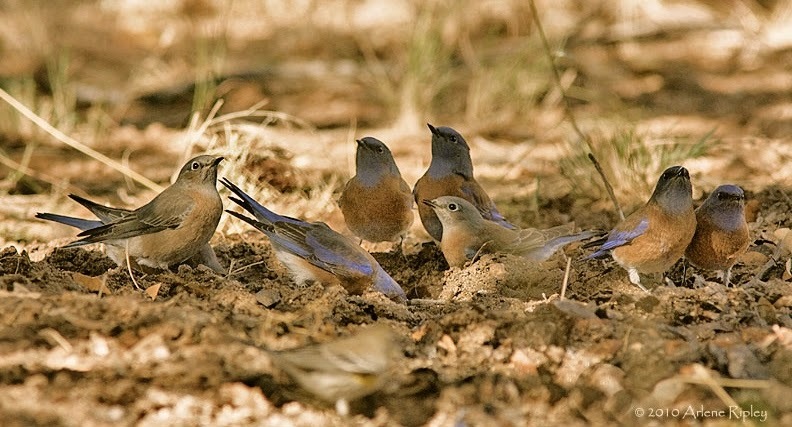 Art credit: "Western Bluebirds (Sialia mexicana) Flock at the Water Tanks," photograph by Arlene Ripley © 2010 (originally color). Mary, is a powerful and creative writer. Having met her on many occasions.